When renting a storage unit, you are given the opportunity to use it any way you want. Typically it is used for storing goods, but did you know that it can also be used for creating good, too? With our climate controlled units, the opportunities to utilize your space are endless. Check out our list of suggestions below to see how you can not only make the most out of your unit, but your community as well. Transforming your storage unit into a point for collecting donated goods is easier than you might think. 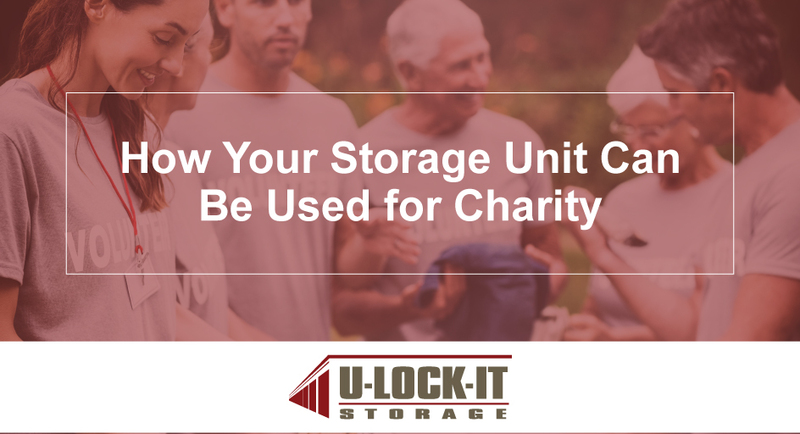 After establishing your charity event, you can spread the word about allotting your storage space as means for others to drop off their donations during certain hours. With climate controlled units, they will be able to hold and keep any item safe until they are donated to those in need. As many have seen from the popular television show Storage Wars, auctions are frequently held at storage unit facilities all over the world. Although the majority of the time the auctions are meant for personal profit, you can hold your own storage auction and have the proceeds go to your charity of choice. With a climate controlled unit that hosts perishable items, you don’t have to worry about goods such as pet food going bad. We can keep them safely stored for as long as you need. Collecting the items is all you’ll need to focus on. Unfortunately, thousands of people go without a coat each year. This can especially be detrimental in the winter season when people need them most. However, with our spacious units, you can fit more than enough coats that others in need can have access to. The coats can even be kept warm in heated units. Not everyone has access to a good pair of shoes. And in some cases, shoe drives do not always have the space for their donations. Luckily, renting a storage unit, or even multiple units, can prevent this from happening. With your own space big enough for a drive, you can keep the fight for the cause going. There have been many successful clothing drives that have popped up the past years. More notable clothing charities are those that benefit adopted children. In some cases, children that have been recently adopted are in need of a whole new set of clothes. Buying essentially a new closet is not cheap, which is why clothing drives are very beneficial to the families in need. With a storage unit that has plenty of space for a clothing drive, you can make a difference in their lives. It’s true, hosting a yard sale doesn’t always have to be in a yard. Gather all of your and even your friends’ items that you wish to get rid of and host a yard sale for the whole community. With a large storage unit, it’s possible to even have multiple yard sales! The money you make from the sale can be donated to a charity of your choice. In need of more ideas on how to make the most of your storage unit? Contact us today at (256) 373-5495 for more information.